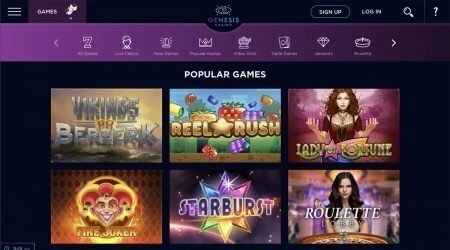 For players who are always looking out for new and upcoming casinos to try out, Genesis is an excellent prospect. To launch its service, the team has put together a space age-themed website, with science fiction-inspired text to match and astronaut graphics. For players in the UK, there is a generous welcome bonus featuring a 100% deposit match, along with free spins to attract interest. At Genesis, the motto is “There’s no place like space”, and the company’s enthusiasm for this random theme is entertaining. Look out for promises of unexplored galaxies and alternative dimensions packed with prizes. In terms of the software and web design used, the layout is nice and clear with large icons that can be scrolled through to search for other titles, along with an ever-present menu bar for conducting more complex searches. The colour scheme suits the theme, with constellations imposed over planetary artwork and a purple backdrop. The designers have finished everything off carefully here, leaving no white spaces or clutter, and ensuring that the navigational tools are simple to use. With so much competition in the online gaming industry, it’s often the case that players lose interest and end up with a number of different accounts, rather than staying loyal to one casino. To avoid losing its clientele, Genesis runs a good range of bonuses throughout the year. The Top of Form Bonus is available to anyone who has placed a deposit in their account, and awards three winners with a cash bonus of £210 each. All that players have to do to enter is place a stake in blackjack, as for every two-card hand they are dealt, a ticket with their name is entered into the random draw. The Weekly Mission Bonus takes place from Monday to Thursday each week. To enter, players have to make a deposit of £50 or more on one of those days. As a reward, they will receive a bonus of 25% on their deposit up to a value of £100 by Friday. 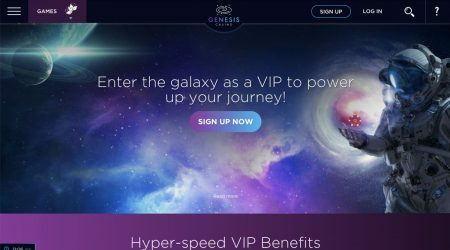 The welcome offer at Genesis is described by its team as “astronomical”, and it is pretty impressive. To encourage players to get started on the site and locate all their favourite titles, there is a welcome offer of 100% up to the value of £100 and 30 free spins on the Starburst game. Players need to claim this bonus in one of two ways – they can either head to the cashier to request it, or they can select Bonus from the drop-down menu. Once a player has signed up to the casino, the bonus is available when their first deposit is made. The free spins will be on offer for ten days from the day of the initial deposit – that’s 30 spins each day. These are available for 72 hours from 12pm. This means that it’s vital for players to get going as soon as they have signed up for an account. Once a bonus or series of free spins has been accepted, the player is obliged to fulfil a series of wagering requirements. Unless the terms and conditions of a specific offer say different, this will be 40 times the original amount. Until these requirements are complete, a player will not be able to make a withdrawal. Furthermore, bonuses are only available for 14 days from the time they are credited, and if the player has not met the wagering requirements within this timeframe, then the bonus money along with any accrued winnings are forfeit. When the bonus is active, the maximum bets are £5 on video games or slots and £30 elsewhere on the site. When a player first signs up to a new casino, it can be tempting to rush straight in and accept the bonus offers. However, as the terms and conditions can be complex, it’s always worth checking beforehand to avoid any confusion. Holiday promotions are becoming more and more common at online casinos, and Genesis is no different. The casino runs a regular competition where the prize is a break on a cruise ship or to another exotic location. To enter, members have to opt into the offer, and then make a deposit of £50 and wager this amount for one ticket in the draw. Free spins give players the chance to spin the NetEnt reels without having to pay for a stake from their own funds. Clicking “spin” won’t change a player’s balance when they are using free spins, and these little rewards are made available regularly. Monday is Free Spins Day at Genesis casino. For every player who deposits and stakes £10 or more between Thursday and Sunday, a certain number of free spins are sent to their inbox. As the games are different each week, there is no set number of spins. When it comes to the choice of games, Genesis has really pushed the boat out, with more than 1,300 different titles on offer. These include jackpot games with impressive rewards, classic video slots, and all the table and casino games that experienced players expect. 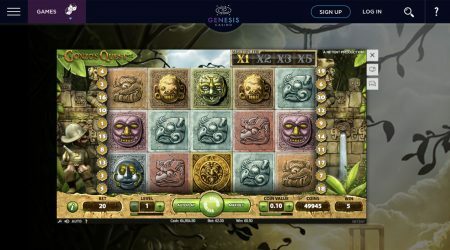 As well as Starburst and Gonzo’s Quest, there are progressive jackpots such as Hall of Gods and Mega Moolah for players who like to accumulate their winnings. At the casino, the choice is not quite as varied, but care has been taken to provide all the key titles. There is the opportunity to spin the wheel at the roulette table or try a few hands at blackjack or baccarat. Many people are drawn to the drama and immediacy of a live casino area, and at Genesis, there is plenty to tempt in card fans. Developed by Evolution Gaming, the casino offers Caribbean Stud, Texas Hold’em and Three Card Poker, as well as a range of other games. Whatever a player’s preference may be, there is no need to download any software in order to get started as every title can be played straight from a browser. It’s also worth mentioning that there are trial versions of many live video games, where people can try out the action for free or watch to see how others play before diving in. For those who are interested in trying out online gambling, one of the biggest concerns is passing their details over to the casino. They may have fears about security or losing their funds, as the experience is all new. However, online casinos know that their patrons demand an easy, fast and safe method of payment and they provide a number of choices. The familiarity of certain methods such as credit cards and e-wallets should reassure most people who open an account with this casino. Genesis has arranged a good selection from which their clients can choose. Payments and withdrawals can be made via Mastercard, Visa, Skrill, Neteller, ecoPayz, Entropay and bank transfers. The minimum transaction is £10 but all are free, and for deposits, the money is available instantly. Withdrawals can take up to three days. When players need assistance with any aspect of the Genesis casino service, there are a number of ways that they can contact the company. The best place to start is the question mark image, which is in the right-hand corner of the site at the top of the page. This provides links to details on the casino rules, the extensive FAQs section, a lost password function, a live chat option and the contact us section. Players can call customer support on 0800 755 5348, or they can email the team on [email protected] In most cases, live chat is the easiest option to go for as the requests are answered quickly by a knowledgeable member of staff. Genesis may not have a contact form, but the other communication channels more than make up for that. Player security is a top priority at any reliable casino, and at Genesis, the games are regularly checked by a third party for fairness, and any monies owned by customers are kept separately from those of the company. To ensure that these rules are complied with, Genesis is licensed by the Malta Gaming Authority and the Gambling Commission in the UK. As well as being trustworthy, Genesis is a fun place to visit, with quirky space-themed imagery and sensible player promotions, along with a worthwhile welcome bonus. The support section is refreshing as it includes a UK phone number, as well as a live chat option, and there should be a method in the payment options to suit everyone. With more than 1,300 titles spread across the website, it could be argued that Genesis has provided its account holders with too much choice. However, as it is powered by intuitive software and includes an excellent search function, this should not be too much of a problem. 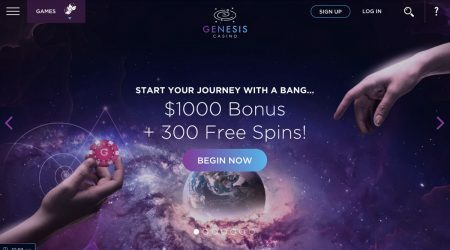 It is easy to recommend Genesis to novice or seasoned players who appreciate a playful element and demand a well-regulated casino.